Happy Friday Everyone! Hope you guys had a wonderful week. My week was cool, it was a busy work week for me, so no sewing got done after work. But one exciting thing happened, I had the privilege of meeting with one of the founders a jewelry and accessories company called, Hanuel. This company is AMAZING and I'm not just talking about their products. Everything they represent and their vision inspired me. During our meeting, they presented me with some of their fabulous statement pieces, which I can't wait to wear. Here is a pic I posted of a few of the items, Here. I might just make something to go them, but I'll definitely let you guys know. 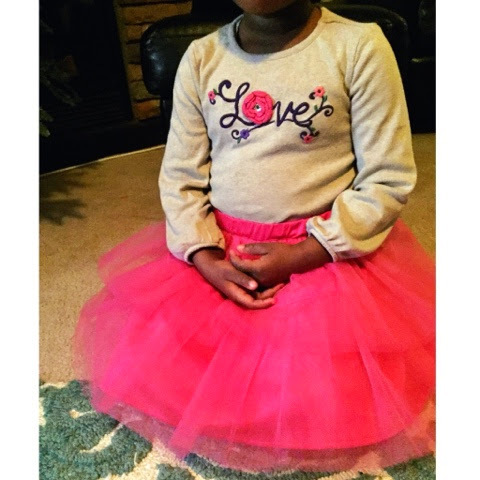 Moving on, on Christmas day my beautiful niece asked me to make her a "Tutu" skirt. I asked her what color she'd liked and of course she said, "Pink." 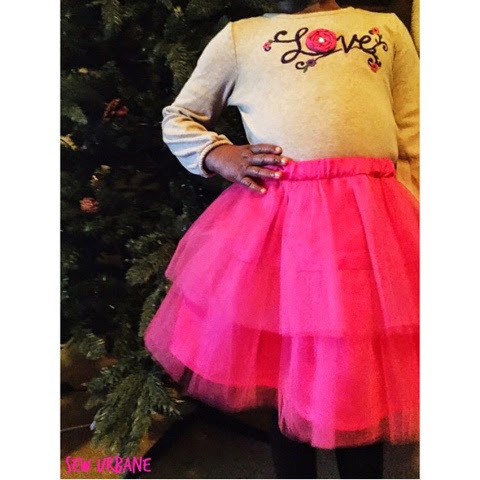 The skirt is pretty easy to make, just layer some tulle on top of a satin circle skirt, add elastic, and voila! you're done. But what's the fun in that? I like testing out patterns and doing reviews, so I decided to use Simplicity Pattern 1816 for her skirt. Below is the pattern review. Pattern Description: Child's & girl's pull on tiered skirts sewing pattern. Did it look like the photo/drawing on the website once you were done sewing with it? Yes, it does. Were the instructions easy to follow? The instructions were easy to follow. But I made my own adjustments. What did you particularly like or dislike about the pattern? I love that it's an elastic waist skirt. It allows you to tighten and loosen it easily at the waist for a better fit. I did not like the finishing of the waistband. I didn't like that the serged edges will be showing on the in side of the skirt. I like the inside of my garments to be as clean and beautiful as the outside. Pattern alterations or any design changes you made: The only alteration/changes I made was at the waistband. I folded the waistband in half, lengthwise. Stitched one of the unfinished edge of the waistband to the skirt at the waist. Pressed 5/8" of the opposite waistband edge, pinned it to the inside of the skirt at the waist. And then stitched in the ditch from the outside. Would you sew it again? Would you recommend it to others? Yes, I'll definitely sew it again. Maybe a mini maxi version. Thanks for stopping by.. If you have any questions regarding making this skirt, feel free to let me know. Omg this is so cute! I want to make a tutu now. Aww glad you like it. Thank you!